Pete Marsh Art - Landscape > Scotland in Uppermill!! « Rival Sons the finished painting….or is it? It is always a pleasure to visit The Millyard Gallery in Uppermill and today was no exception. Today I have delivered four framed paintings two of which were painted en plein air in Scotland and a studio painting based on a smaller en plein air painted near Chorley and another en plein air painted on a tree lined path near to Samuel Crompton’s birth-place, Firwood Fold. This painting was done on a bright sunny day during a week long landscape painting trip to Kingairloch. During an evening walk the previous day we discovered a tree lined track next to the River Glengalmade. The light was fading so I vowed to return the next day to paint this track. 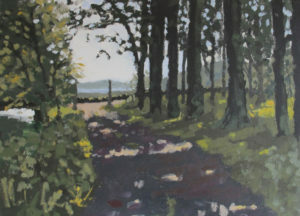 Looking towards the end of the track and on to Loch Linnie I set up my easel and worked en plein air to capture the light that trickled through the trees. When I got back to my studio I produced a larger studio painting based on this view…which sold very quickly. This smaller canvas was painted “in the field” and because of the changing light is a little bolder and livelier than the studio version. There is now a tiny bit of the west of Scotland in Uppermill. During a visit to Coldingham I was struck by the words of the monks that used to live and work at the Priory. They felt that working the land was not merely physical labour but constituted a form of worship. I think this idea can be applied to painting in the the landscape. There is something very special about being in the landscape and this spiritually uplifting experience is somehow further enhanced by trying to paint it. You really do feel at one with nature, not just some-one on the landscape but actually in it and part of it. I set up my easel in the corner of a field on quite a blustery day. After working at my easel for a little while I realised that I had become quite cold despite the bright sunshine. I put on my wind/shower proof jacket and resumed painting only for the easel to be turned over by a sudden gust of wind. I just caught the painting as the back legs of the easel lifted from the ground! 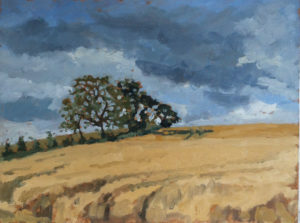 The larger studio version of this painting sold in a gallery just down the road from where this painting was produced. This en plein air painting of a corner of east Scotland is currently available from Millyard Gallery, Uppermill…contact details below. 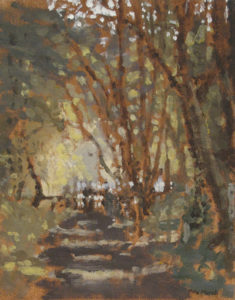 This is the larger studio painting from two en plein air paintings produced down a very dark path. I couldn’t help but think of the famous French painter Theodore Rousseau (Barbizon Group) who painted in the Fontainbleau forest when I saw this path. I had travelled along this path a number of times before but many years ago so I knew of it’s existence but it took me a little while to find it again. Covering myself in anti-midge solution I set my easel on the path looking towards the end of the track where the trees opened up to the fields beyond. 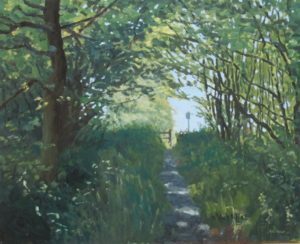 I quickly decided that the series of paintings would be called “Path With Hope” for that was the feeling that overwhelmed me…painting from the cool shadows looking to the light and warmth past the gateway and sign-post. Light penetrates the dense, tall trees to dapple the path. A stile or gate is silhouetted against light at the end of nature’s tunnel. Painted en plein air one Sunday morning, this little painting of a corner of England close to the birth-place of Samuel Crompton, was the catalyst for further works including a studio painting “Red Coat”, an etching “If You Go Down To The Woods Today…”and a mono-print and mixed media work “Light At The End Of The Tunnel”. All four framed original paintings are available from Millyard Gallery, Uppermill. Please contact Rebecca or Janice at millyardgallery@gmail.com or 01457 870410.